For those who may not have heard, Gabe and I lost his father, my husband, Rob, earlier this year to cancer. 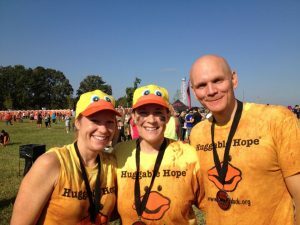 Rob was a true pillar in our family and a passionate supporter of Chemo Duck — he was our loudest cheerleader and our greatest partner in this journey. To honor his memory, we have created “Rob’s Memorial Flock,” a fundraiser that will demonstrate just how many people’s lives Rob has impacted and will continue to impact, as his legacy lives on. 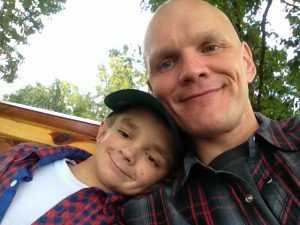 Our hope is that by joining this special initiative to get more Chemo Ducks in the arms of some very special kids, you will also help us make Rob’s memory synonymous with the love and hope that our organization is so passionate about sharing. We invite you to be a part of Rob’s Memorial Flock and help us raise $3,000 — the equivalent of 100 ducks — in honor of our beloved husband, father and friend. Even a small donation will still make a huge difference in helping us reach our goal. We appreciate your support and know Rob would be proud to have each and every one of you as a member of his memorial flock!